Montebelluna-Freiburg-Basel-Frankfurt-Helsinki-Säkylä. only this kind of traveling would kill you and on top of that I had to recover from the Worlds and get ready for the TT and RR Finnish Championships. I had 4 days to get ready. Monday and Tuesday I was in Freiburg. First of all I had to bring my TT bike to German time trial legend Michael Rich. He made the last adjustments on the bike. He has been so helpful. Through him I got my TT rocket and he helped me to find a good position. I did som short training on the road both Monday and Tuesday. It was good to spin my legs and get ready for the 2 races in Finland Tuesday evening I packed my bikes and Wednesday morning I had the flight to Finland. At Basel Euro Airport I met Thomas Dietsch from Team Bulls. He was on his way to Vancouver and BC bike race. We had breakfast in the lounge and I must say it was the best lounge I have ever been in. A continenetal breakfast was a good start for e day. Via Frankfurt to Helsinki. In Helsinki I waited for my bikes. Nothing showed up. My brother had picked up a car from http://www.honda.fi, so we continued without bikes to Säkylä. At this point, a big thanks to Honda for the car, made the logistics so much easier. My bikes were supposed to arrive with the next flight. I tried to call the ground service office, but they close at 6pm. Insane! How can you close a lost luggage office at 6pm? Helsinki is an international airport, so it should start to offer services like every other international airport..
After making phonecalls to several numbers I finally agreed that my bikes can be tagged for the last flight to Turku. My brother and father would then pick them up at midnight. Easy, we thought, my bikes will be there when I wake up. The adventure got even more exciting. As my brother and father came to Turku airport, the TV monitor said the flight had been cancelled. Not a soul was to be seen and a few more phonecalls informed them that my bikes were somewhere at Helsinki airport. They drove to Helsinki and back to Säkylä. The pick up procedure turned out to be a night trip. At 5 am they were back at the summer cottage I hsd rented for the weekend. Luckily I did not know anything so I had no time to start worrying. I slept like a child the first to nights and days. I was so tired from traveling and naturally the worlds were still making my legs tired. TT Friday evening. Summer at its best. Close to 30 degrees and some thunderstorms predicted. Start at 17.56. I was nervous. I did not know how I would ride on the TT bike. I tried to keep up a good speed, remeber to pedal with the right frequency and especially to keep in mind all the tips Michael had told me. I won with 1min 47sec. Still there are things that hasnto be done better. I will work on it. 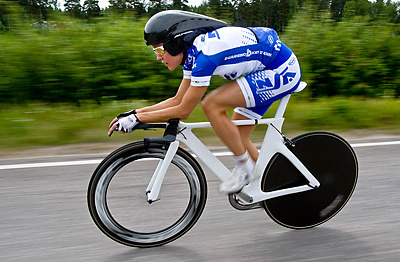 The positive news after the race was: I gotselected to do the World Championships in Copenhagen in TT. The men’s race was unfortunately cancelled due to a heavy thunderstorm. I heard one of the riders was hit by a lighning, but luckily nothing bad happened. Something worth to mention is that our Minister for Europe and Trade, Alexander Stubb, started and finished the race. The lightnings did not stop him. RR Saturday. I had about 15 hours between the TT and RR. Not really much time to recover. My legs were not hurting in the evening and in the morning I felt that I had recovered pretty well. It was hot, more than 30 degrees. The course was flat like a pancake. 30 woman on the start line including me. Me attacking and 30 woman riding against me. Difficult! I feel strong at the moment, but against 30 riders there is not much you can do. I attacked, and attacked. Everyone following me. After 1 hours riding time I started to get desperate. What can you do on a completely flat course with only 4 corners? I called the servicecar. Asked the former national coach Kari Puisto for advice, who always is my serviceman when I race in Finland. He told me there is nothing else I can do, only continue attacking. In the next corner I did. Got a group with 7 riders going, got them all to work together. 10 km later I did the next attack. Looked at my srm power meter, saw 400 watts on it an thought I have to ride 400 watts for some more seconds. If I blow up, so will the rest. I got one rider with me. The next 20km I rode with her, made the next attack with 20 km to go and road solo til the finish. It was such a hard race and today I feel so tired. After the race we continued to my twinbrother’s place. His youngest son, and my godson, had his 3rd Birthday. A fine dinner and a birthday cake made the party perfect. Now I want to thank my parents for helping me. My mother who cooked and made the days easy for me. My dad who fixed my bikes, heated the sauna and organized everything for me. My big brother Ralf who went to the team manager meetings, picked up my numbers, drove the service car and checked my bikes with my dad. Kari Puisto for his great tips and support. He made me believe in myself when I started to dout. It was also great to have my twin brother and his family watching the race on Saturday. The best prize was the self picked flowers I got from his 3 boys after I crossed the finish line. A lovely gesture.